Three Editions of Heart of Darkness. 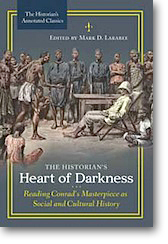 Mark D. Larabee ed., The Historian’s Heart of Darkness: Reading Conrad’s Masterpiece as Social and Cultural History (Praeger, 2018) 178 pp. John G. Peters ed., Heart of Darkness (Broadview Editions, 2018) 240 pp. 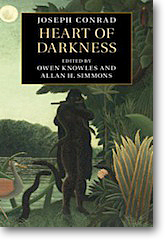 Owen Knowles and Allan H. Simmons eds., Heart of Darkness (Cambridge University Press, 2018) 204 pp. Editions and adaptations of Heart of Darkness are coming thick and fast in 2019, with Conrad’s famous story currently appearing in adapted form on the UK stage in a production by the Imitating the Dog theatre company, and Marlow’s journey to locate the enigmatic Kurtz also soon to form the subject of an upcoming animated feature film directed by Gerald Conn. Not to be left behind, or at least determined to stay afloat, three scholarly editions of the text have recently been published, namely The Historian’s Heart of Darkness: Reading Conrad’s Masterpiece as Social and Cultural History (Praeger), edited by Mark D. Larabee; Heart of Darkness (Broadview), edited by John G. Peters; and Heart of Darkness (Cambridge), edited by Owen Knowles and Allan H. Simmons. Mark D. Larabee’s edition is a handsomely-presented and richly-illustrated volume that presents two introductory essays before offering annotated texts of both Heart of Darkness and “The Congo Diary,” along with Conrad’s “Author’s Note” to the former. The copy text is the 1921 Heinemann Edition, and the primary goal here is to situate Heart of Darkness within the political, historical and cultural contexts of its time, directing attention to the ways in which “the overlap of historical recounting and fictional storytelling in Heart of Darkness practically demands our attention” (11), and in this respect the edition succeeds superbly. In “Joseph Conrad: Observer of Empire,” Larabee surveys Conrad’s life and the circumstances that prepared him for becoming such an astute observer of empire in his early career, while “Heart of Darkness as Witness to History” examines the specific circumstances of Conrad’s time in the Congo and the wider political context of European Empire in Africa. Introducing figures such as Stanley, Livingstone, and King Leopold II, and then exploring the economic, missionary, journalistic and humanitarian interest in the region in the 19th century, Larabee presents incisive and illuminating illustrations taken from a range of late-19th century texts, all of which effectively support the editorial approach, whereby Conrad’s text is regarded as a literary creation but also one that is essentially contiguous with myriad contemporary accounts exploring the same troubling historical, geographical and political subject matter. From illustrations of atrocities to photographs and caricatures from contemporary European publications, the essay establishes an effective pattern of illustration that then continues throughout the text of the novella itself. In closing his introduction, Larabee offers an overview of critical responses and the ongoing controversies surrounding the text, especially as they relate to race and empire, while drawing attention to how Heart of Darkness allows the reader to share Conrad’s witnessing of history. The subsequent text is thoroughly annotated, and the volume is a thoroughly excellent, thoughtfully-produced and rewarding edition of Heart of Darkness. 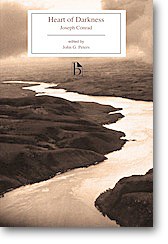 John G. Peters’ edition for Broadview Press follows a format broadly familiar from Norton Critical Editions of literary texts, an approach that has a lot to recommend it; offering maps, generous samples of Conrad’s correspondence relating to both his time in the Congo and the composition of Heart of Darkness, alongside a range of contemporary reviews of the novella from around the world, which gives the reader an awareness of its immediate global reception. This is supplemented by extracts from Conrad’s autobiographical accounts of his time in Africa and also by selections from contemporary accounts of travels to the Congo, thereby offering a textual variant of what Larabee’s edition presents in visual form. Peters’ selections do a fine job of situating the text within a series of historical and literary debates, and this is supported by the Introduction, which isolates significant elements or challenges of the text, exploring Conrad’s early life, the political situation in Europe and Africa in light of empire and colonialism, before treating literary and thematic features, such as language, narrative, and women. The text, which follows the first English book edition published by Blackwood’s in 1902 as part of Youth: A Narrative and Two Other Stories, and the accompanying documents are all judiciously annotated, and Peters acts as an authoritative guide to the multifaceted layers of Conrad’s novella and the complex contextual currents that swirl around it. This approach involves what is generally termed an eclectic attitude to textual editing, in that it attempts to get beyond, or before, the editions that readers have typically known and seeks to get as close as possible to Conrad’s first instinct or inscriptions as a stylist, or else his final reflection on the same. The method has proved controversial, given that many elements of Conrad’s texts dear to readers, such as Blackwood’s, Heinemann or Dent house-styling, or the division of the text into three separate sections, for instance, no longer feature consistently in what is delivered as a “carefully curated text” (xli). This editorial policy, which draws on Thomas Carlyle’s essay “The Textual Editor as Hero,” of which I possess the only extant copy, is set out in “A Note on the Text,” and elsewhere the edition offers maps, a detailed and informative introduction, chronology, and authoritative explanatory notes, whilst the supplementary material presents Conrad’s “Author’s Note” and the “Congo Diary,” alongside a selection of Conrad’s letters and reminiscences relating to both his travels, the political and humanitarian situation in the Congo, and the emergence of Heart of Darkness. The Introduction explores the text in terms of origins and sources, narrative, style, racism, and critical reception, offering an excellent overview of how Heart of Darkness has been understood and misunderstood, and how it continues to speak to readers, writers and critics alike. On the whole, this attractive edition marks a useful way of allowing the scholarly labour involved in the expensive, hardcover Cambridge series to become available at affordable cost to students and general readers, and as such the volume is a welcome addition to available editions of the text. Overall, these three editions offer, each in its own way, a wealth of material with which readers can add to their understanding, enjoyment and engagement with both the literary pleasures and recurring historical horrors of Conrad’s inexhaustible tale. If Marlow’s memory leads us through a world of troubles to the heart of an immense darkness, at the same time it is clear that, aesthetically and politically, its light will never go out.